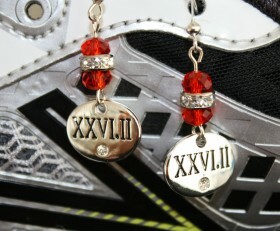 Show off your huge accomplishment of running a marathon or half marathon in these earrings. A beautiful silver charm with XXVI.II (26.2) with a clear crystal is accented with red Swarovski crystals and bling bead spacers. It will definitely make a statement in a very elegant way. You can wear these casual or too work. Also available in XIII.I (13.1). Select your race distance before checking out.